Tom Meacham, a natural resources attorney, has joined Trustees for Alaska’s Board of Directors. His detailed knowledge of Alaska’s environmental and public land laws is a great asset for the organization to have at the Board level. He’s been practicing law in Alaska since 1971, and worked on the Alaska National Interest Lands Conservation Act. Tom Meacham on his descent of Mount Marathon last July. Tom, a Colorado native, has long been involved with Alaska’s natural resource issues and citizen advocacy groups, which began when the U.S. Army assigned him to Ft. Richardson (Anchorage) in 1967. He has been a member and officer of the Mountaineering Club of Alaska since 1967, and he reached the summit of Denali with two other Club members in 1987. Tom also helped create the Chugach Park Access Coalition and the Alaska Quiet Rights Coalition, was the first member of the Alaska Wildlife Alliance, and has been a member of the Alaska Chapter of the Sierra Club since 1967. In 2008, he was presented with the Alaska Conservation Foundation’s Lifetime Achievement Award. 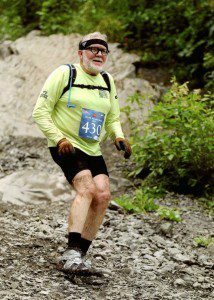 Tom’s other interests include collecting and reading historical non-fiction, playing and collecting brass musical instruments, collecting odd motor vehicles, and mountain hiking and trail running. To date, Tom has completed 31 Mt. Marathon races, held every 4th of July in Seward, Alaska. Tom lives on the Anchorage Hillside with his wife Jane, close to a major entrance to Chugach State Park. Read his bio and meet the other members of the Board of Directors.